﻿ The Disposable Memory Project / Our Polar Explorer Returns. Well, the unbelievable has happened. One of our cameras has made the most remarkable journey. A journey that few humans would have the opportunity to make in their lifetime. Not only has it travelled almost 19,000 miles, but it has travelled to the most extreme parts of our globe. Little Camera 159 is the camera which made its way to the South Pole, and survived the journey home to tell its tale. We will fly via Copenhagen to Greenland where we are being airlifted by helicopter to the ice sheets to camp out and do hydrological field work. I was handed one of your cameras at a remote field camp called Sky-Blu at the base of the Antarctic Peninsula, whilst working for the British Antarctic Survey this summer. I took it with me on a project at the South Pole, and then returned with it to the British Base, Rothera. I took a couple of pics at the South Pole – apologies if there are a couple of spoiled pics, but it was -30c and my gloved fingers were awkward! The giant Pooh Bear is another story altogether, but the image of a giant stuffed bear at the Pole was too good to pass up! The camera continued on with Matt V.T. and then into the hands of Celine N, who brought it back home via Chile and Ireland. We’re super excited to have been able to get a camera into the most extreme place on our planet, so thank you to everyone involved in getting the camera safely home. We hope you enjoy the images! View the Camera 159 page for more details on its journey. Camera 235 has been travelling around Singapore for the past 243 days, and has returned home with a batch of truly wonderful images. Released in October 2009 by Shareen, the camera started its life at the opening of ‘thirtysix’, a local analogue camera shop – a perfect birth for the camera – there was even cake. The camera moved around the city for a few months, and then we heard nothing of it until January of this year, when it was found again by Grace T, who finished off the film, and sent the camera back to the project. Thanks to everyone who took part in the camera, and Eve T. for being our local project office and collecting the camera. If you recognise any of the images, the people or locations in the photos, please add a comment to the Camera 235 page. As you can see, we’re still waiting on some to come home (some times it takes a while for them to get back to us in the UK! ), and others have only just been finished, but in all cases, we’re really excited about getting these images online – especially Camera 159, which is our star North/Sole Pole explorer! If you’ve got a camera in your hands, which you’ve finished, or just need to pass on, remember to drop us a line, and we’ll keep track of it. If you’d like to help out the Project, by offering yourself as a local address where people can send completed cameras (which helps keep the cost of people sending cameras home as low as possible), drop us an email with where you live and we’ll send you details on being a local DMP office! 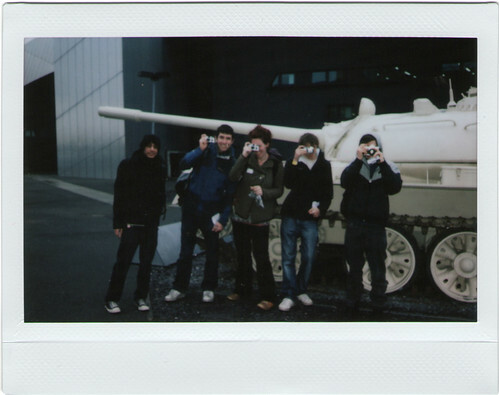 FEUM 1001 – 1005 (5 cameras in total) were released on 24 March 2010 at the Society’s trip to Don McCullin’s photography exhibition: Shaped By War at Imperial War Museum North, Salford Quays (Manchester). The other 5 will be release at the society’s next trip.